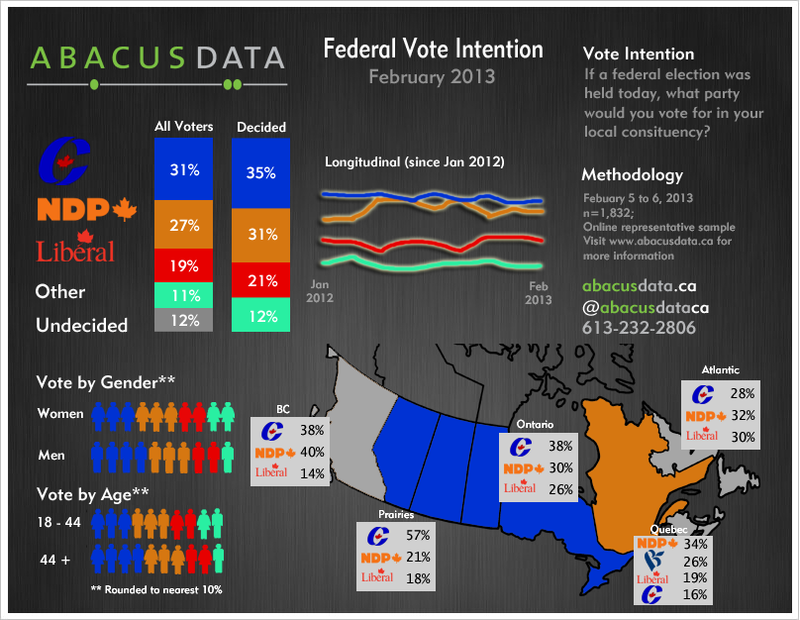 Canadian Politics: Conservatives 35%, NDP 31%, Liberals 21%; Federal government approval rating steady at 36%. According to a new national survey by public opinion firm Abacus Data, the federal Conservative Party holds a small but significant four point lead over the opposition New Democratic Party. 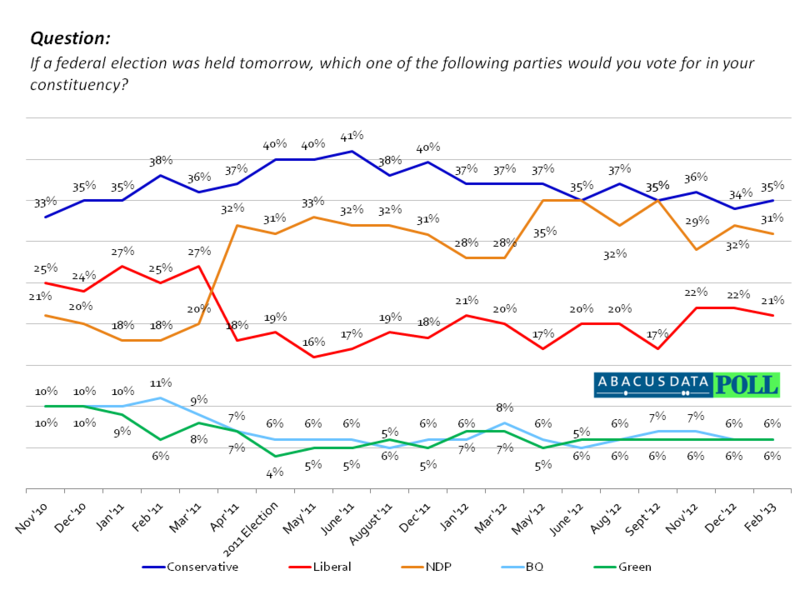 The Conservatives have the support of 35% of decided voters (up 1 point since December) with the NDP in second at 31% (down 2 points since December). The third largest party in the House of Commons, the Liberals, remain in third place with 21% of decided voter support (down 1 point). “Support for the Conservatives is down from the 2011 election but neither the NDP nor the Liberals have gained either. Like much of Canada, the federal political landscape seems to be in a deep freeze,” said Coletto. Regionally, the Conservative Party remains the most popular in Alberta (62%) and in Manitoba and Saskatchewan (51%) while holding an eight-point lead in Ontario (38%). The Tories continue to struggle in Quebec earning the support of only 15% of decided voters in Canada’s second largest province. The NDP and the Conservative Party are statistically tied in British Columbia with the NDP at 40% and the Conservatives at 38%. In Quebec, the NDP continues to lead the Bloc Quebecois but by a smaller margin than last month. This month, the NDP has the support of 34% of Quebec decided voters followed by the Bloc Quebecois at 26%, the Liberals at 19%, and the Conservatives at 15%. The Liberals continue to do best in Ontario (26%) and in Atlantic Canada (29%). With 18 new electoral districts slated to be introduced before the next election, Ontario’s place as primary battleground will only increase. This month, Abacus Data conducted a total of 1,020 interviews in Ontario to get a better sense of what is going on in Canada’s largest province. Province-wide the Tories have an eight point lead over the NDP but there are regional differences of note. The Liberals lead in Metro Toronto by 13-points over the NDP and Conservatives (Toronto: LPC 40, NDP 27, CPC 26) while the Tories have a 19-point over the Liberals and NDP in the Greater Toronto Area (GTA: CPC 44, NDP 25, LPC 25). Considering that most of the seats being added in Ontario will be around the GTA, the Conservatives are well positioned to hold most of the seats in that region and pick up any new seats added. Outside of Toronto, the Conservatives lead in Eastern and Southwestern Ontario (Eastern: CPC 43%, NDP 29%, LPC 26%; Southwestern: CPC 41%, NDP 33%, LPC 21%) while the NDP and Conservatives are competitive in the Northern region of the province (Northern: NDP 41%, CPC 38%, LPC 21%) (note the small sample sizes in many regions outside of Toronto). As usual, the survey also asked Canadians about their views on the general direction of the country, the job performance of the Harper government, and their impressions of the main party leaders. Direction of the Country: One in four Canadians surveyed (39%) believed that the country in general was headed in the right direction while 43% believed it was off on the on the wrong track. This is a marginal change from last month when 42% of Canadians believed the country was headed in the right direction. Approval of Federal Government: Evaluations of the federal government’s job performance remain steady this month with 38% approving of the job the federal government led by Stephen Harper is doing and 45% disapproving. Stephen Harper: Prime Minister’s personal impressions dipped slightly this month. One in three Canadians said they had a favourable impression of him (33%, down 2 points) while 46% said they had an unfavourable impression. Twenty-one percent were unsure or had a neutral impression of the Conservative Party leader. Tom Mulcair: Personal impressions of Opposition NDP Leader were largely unchanged this month with 30% saying they have a favourable impression and 27% saying they have an unfavourable impression. The plurality of respondents continue to either have a neutral impression or are unaware of the NDP leader. The Canadian political landscape continues to be in a holding pattern with vote intentions closely matching the results of the 2011 election. The Conservatives have lost some support in Toronto and in British Columbia but continue to command a big lead in Alberta, the Prairies and in most of Ontario outside of Metro Toronto. Although other research, including our own, finds that Canadians say they would vote for a Liberal Party led by Justin Trudeau, the Liberal Party has not benefited yet from their leadership race. They trail in every province or region of the country except for in Metro Toronto where they have double digit lead over the other main parties. The NDP has been able to maintain most of its supporters from the 2011 federal election while attracting some support from previous Liberal supporters. However due to the underwhelming impressions of Tom Mulcair outside of Quebec, this support is likely soft and up for grabs if the Liberals can generate some excitement around whoever their new leader is. The survey was conducted online with 1,832 respondents in English and French using an internet survey programmed and collected by Abacus Data. A random sample of panelists was invited to participate in the survey from a panel of over 150,000 Canadians. The survey was completed from February 5 to 6, 2013. The margin of error for a probability-based random sample of 1,832 respondents using a probability sample is +/- 2.3%, 19 times out of 20.